Wat Tham Pha Daen is a hilltop temple in Sakon Nakhon Province noted for its rock carvings, gardens, hillside cave and panoramic views over the mostly flat surrounding countryside. 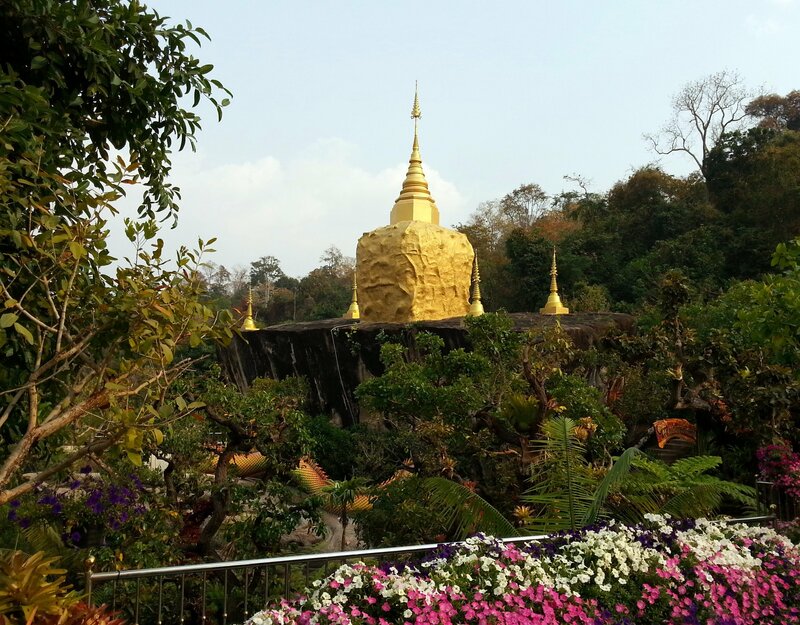 Wat Tham Pha Daen is open from 08:00 to 18:00 and admission is free. 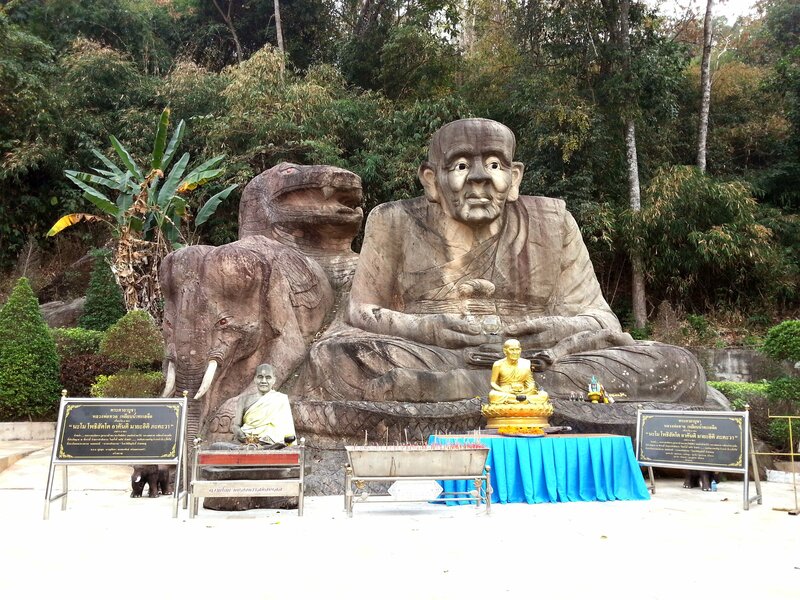 Wat Tham Pha Daen is located on a hillside some distance from the main road. The closest you can get to the temple in your own vehicle is about 2 km from the entrance. Visitors need to stop at the car park at the bottom of the approach road to temple, where there are public toilets and a shared taxi station organised by the temple. 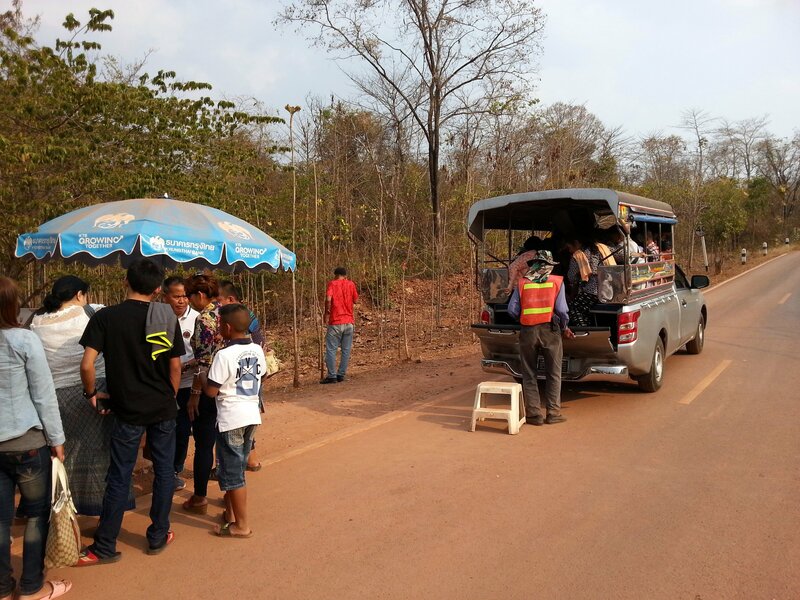 A charge of 20 THB per person is made for the return journey from the car park to the temple. 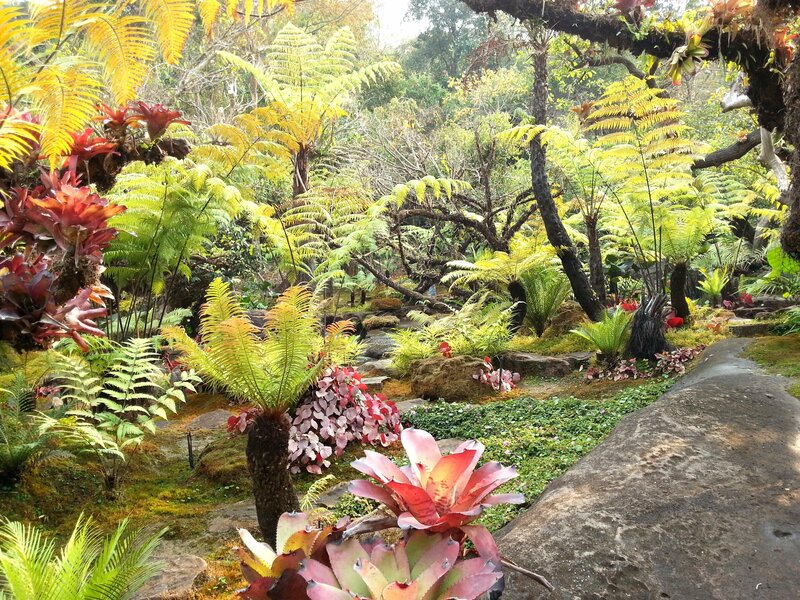 As you enter the gates to Wat Tham Pha Daen on your left hand side is a beautiful garden with a waterfall and colourful plants resembling a fantasy forest. Wat Tham Pha Daen is well known for its rock carvings and there are lots of these hewn out of the massive hard boulders on the hillside. 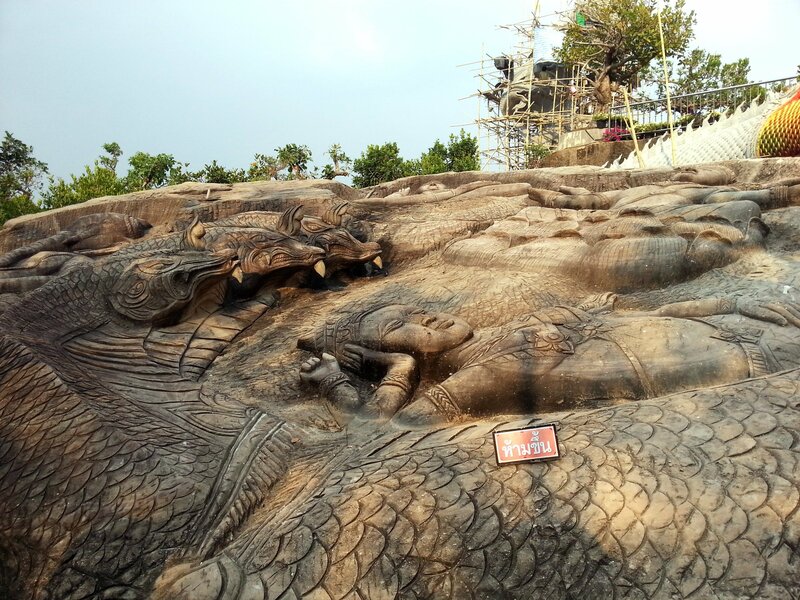 The carving include a giant Garuda, Hindi deities, a large carving of a monk, a dragon and a large reclining Buddha. As you walk toward to the main temple at Wat Tham Pha Daen there are two more gardens on your right. 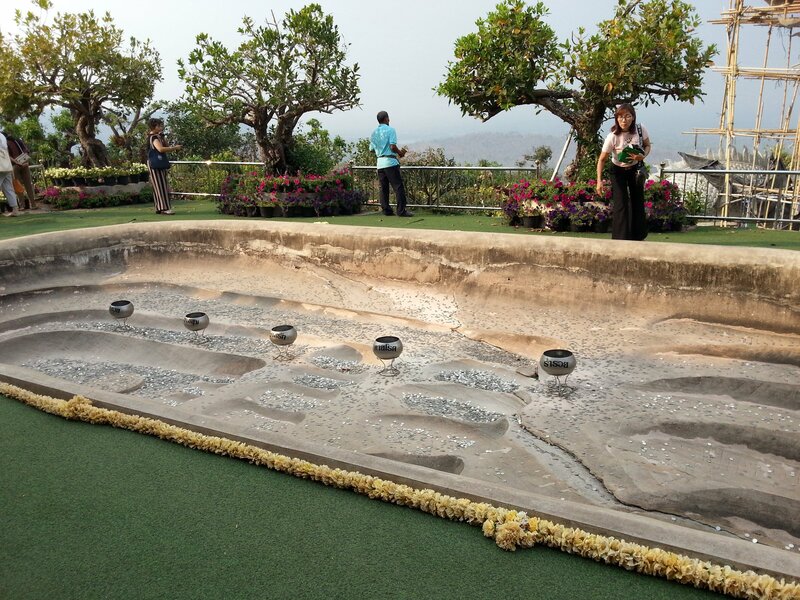 In the first of these garden is a row of metal pots inside a depression shaped like the Buddha’s footprint. For luck visitors attempt to throw 1 Baht coins into the metal pots which, judging by the number of coins around the pots compared to inside them, is very difficult. One of the most recognisable features of Wat Tham Pha Daen is its golden rock with a gold chedi, topped by an umbrella ornament. This golden rock is very similar to the highly revered and more famous golden rock at Kyaiktiyo Pagoda in Myanmar. A new temple building is currently under construction at Wat Tham Pha Daen. There is an older ordination hall on the hill above which appears to be a state of disrepair and no longer in use. The parts of Wat Tham Pha Daen which now attract visitors began to be built around 2012, although the site has had a temple on it a long time before that and the caves above that were used by monks as meditation retreats since the 1940s and possibly earlier. The new temple at Wat Tham Pha Daen is very much a work in progress. The temple is being largely constructed out of wood with wooden supports made from large irregularly shaped tree trunks and beautifully finished wooden wooden panelling on the ceiling. The roof, made from corrugated iron, appears to be a temporary as shelter from the weather whilst constructed is ongoing inside. It will be interesting in the future to see exactly what materials the roof get made out of, probably wooden shingles but we will need to wait and see whether that happens. 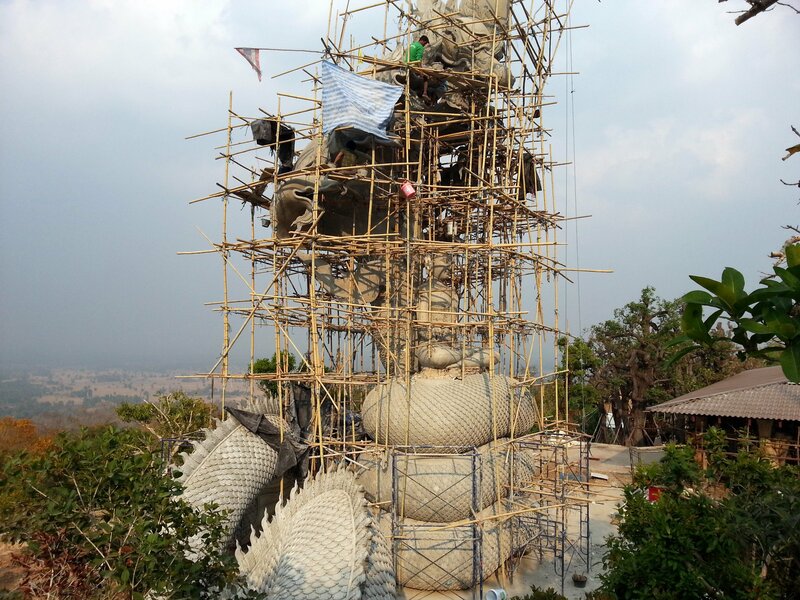 A large statue of dragon is also under construction at Wat Tham Pha Daen. When we visited in February 2019 the main structure of the stature looked nearly complete, although at a guess it looks as though it may take until sometime in 2020 before the paint or tiling on the statue is fully applied and the scaffold can be removed. 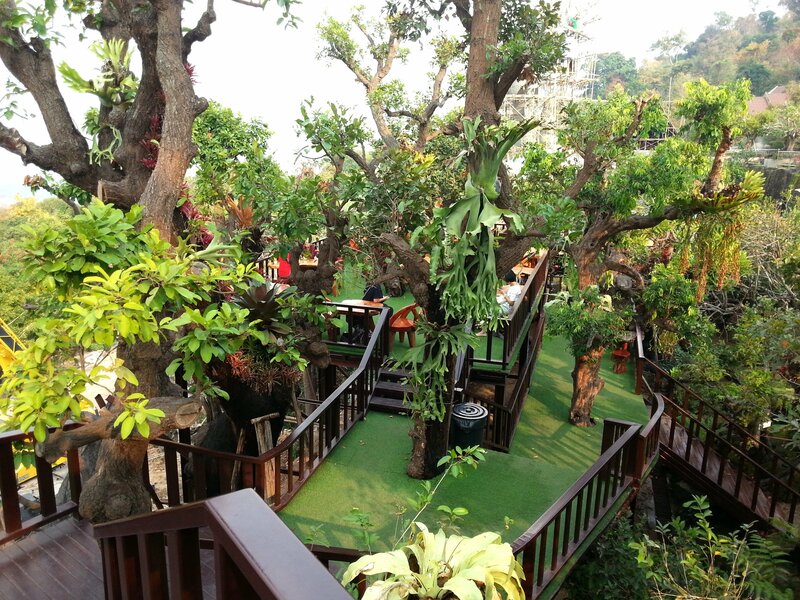 There is also a cafe area by the new temple Wat Tham Pha Daen. This outdoor cafe has a lot of plants and trees in it and fantastic view of Sakon Nakhon City and Nong Han Lake in the distance. There is a nice breeze at this cafe and its a very pleasant place to sit and have a drink and a snack, or for the less agile people you visit the temple with to sit and wait whilst you climb to the viewpoint at the top of the hill. Wat Tham Pha Daen is named after the cave openings above the main part of the temple. To reach these caves you need to climb a very steep set of stairs to the left hand side of the new temple, past the original older temple building, and along a path which leads through the jungle. Near the end of the path the route passes through a cave formed by a crack between two very large boulders. This is the place where monks used to come to live during solitary meditation retreats. 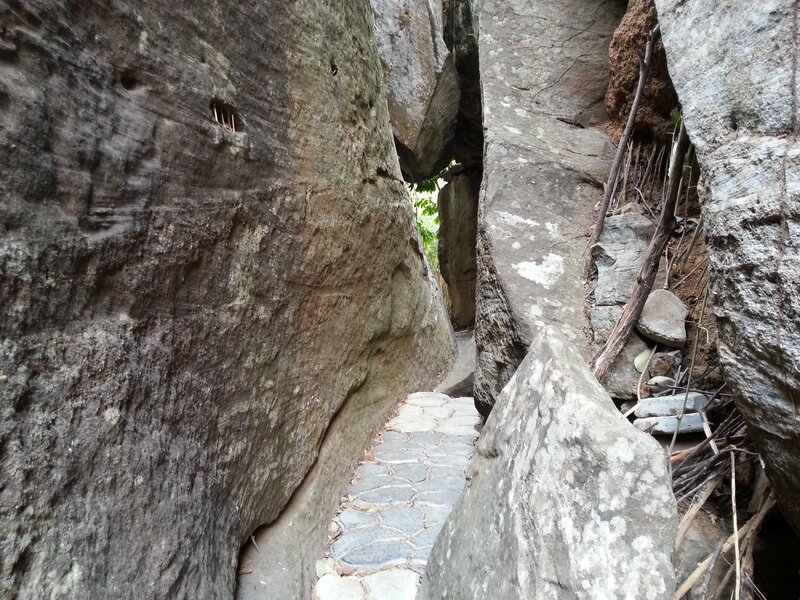 Beyond the caves the path ascends to the top of the hill where Wat Tham Pha Daen is located. There is a small shrine there on top of a large flat area of stone. 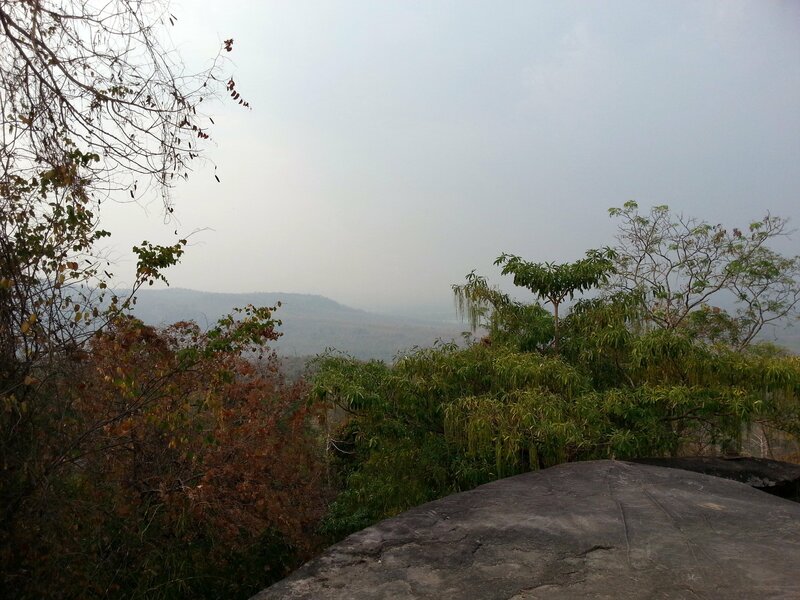 From here you get magnificent view of Sakon Nakhon Province. 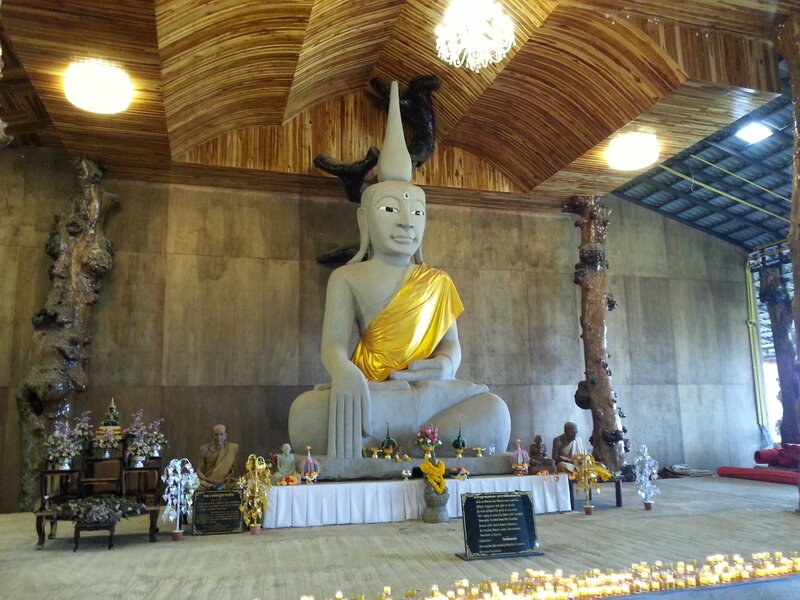 Wat Tham Pha Daen is located 23.3 km by road from Sakon Nakhon Bus Terminal 2.